Joel Arthur Rosenthal, also known as JAR, was born in New York City. Undoubtedly the most influential contemporary jewellery designer in the world, he has been referred to as the Fabergé of the late twentieth century, as well as being compared to Cartier and Lalique. It is, however, more appropriate to applaud his individual style and the extraordinary jewels and objects that he creates. What defines JAR's work is his superior craftsmanship, evocative of the quality of jewels in the eighteenth and nineteenth centuries; his bold sens of proportion, often resulting in comparatively sculptural objects; and his propensity for incorporating shallow and unusual gemstones into his pieces, resulting in a vivid sense of movement and light. His attention to detail is overwhelming, and a single jewel can lead to years of meticulous work before completion. 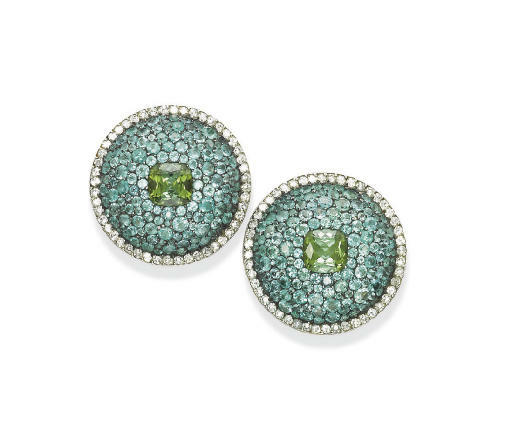 Rosenthal's skill in blending colours of gemstones is legendary. He has had two exhibitions, the first in New York in 1984, and a major retrospective exhibition held at Somerset House in London in 2002-2003. During the latter, four hundred pieces were viewed by visitors using special torches in a darkened environment. The daring range of colours twinkling by night light, and the wildly imaginative designs were, for many, a deeply moving experience. His jewels are often created around exceptional gemstones and Rosenthal will spend years searching for the right stones, indeed, he is famous for matching unique pairs of gems and for re-setting rare stones from much older pieces of jewellery. Rosenthal studied art history at Harvard and, after college, worked in the film industry, and then with Bulgari. In 1977, he opened a shop in Place Vendôme with Swiss business partner, Pierre Jeannet. Rosenthal is not a prolific designer, which is why when jewels such as these come onto the open market; it is not just another jewellery sale but also an exciting event.